In 1866, in addition to the ongoing legal arguments and the first surge of disinterments from the Milliman Tract section of the cemetery, Dr. John H. Rauch's pamphlet, "Intramural Interments in Populous Cities" was published. The City now had another pressing concern regarding the ongoing burials in the City Cemetery - public health. Rauch's writings had more to do with the need to stop burials than to move the cemetery. 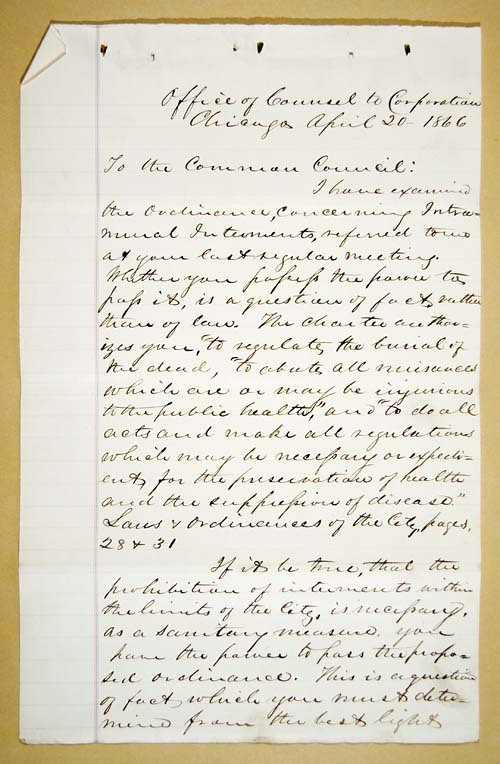 The 1859 ordinance relating to stopping burials was only in relation to the sale of additional lots. Families who already owned lots in the City Cemetery were allowed to continue burials. Also, the potter's field along the eastern edge of the cemetery was in continual use. 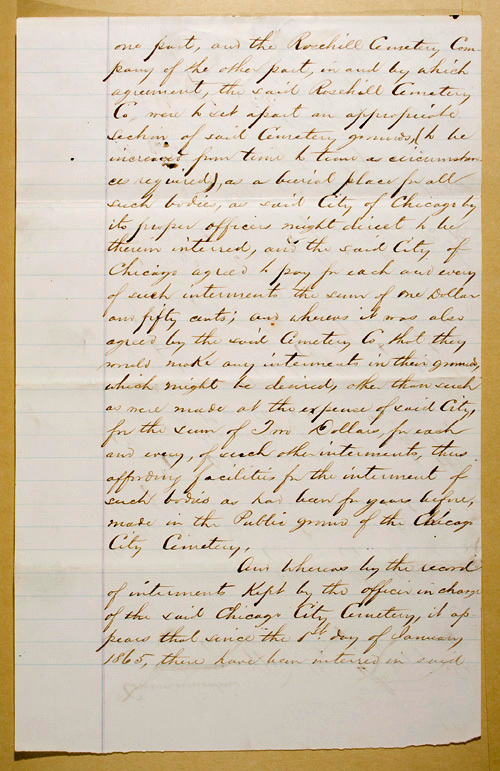 In 1869, with the establishment of the Lincoln Park Act, the Lincoln Park Commissioners assumed control and responsibility for the old cemetery grounds. This document begins with a reiteration of the ordinance for which a special meeting of the Common Council was held nearly an entire year earlier (detailed here.) It continues with the acknowledgement that despite the order to halt burials except in existing family lots and the city's potter's field, there had been 1,640 interments in the 1865. 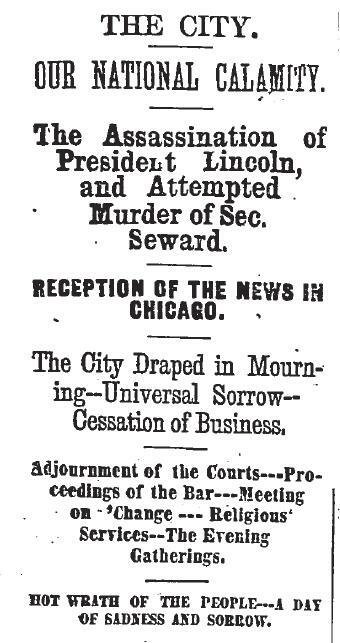 Burials continued through March 1866. 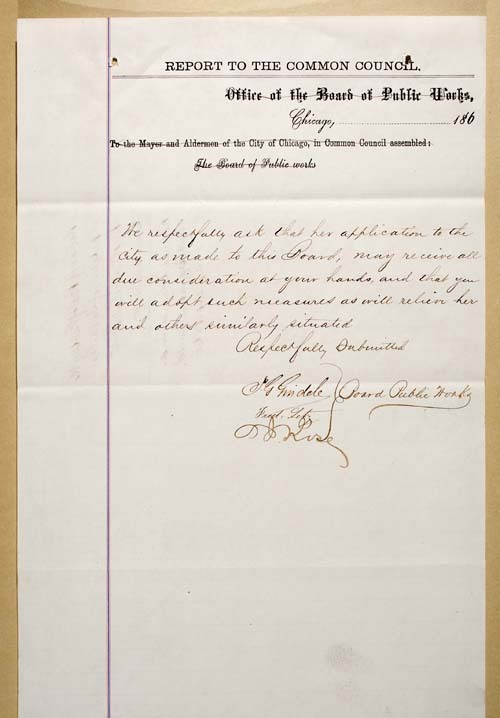 All documents on this page, courtesy of the Illinois Regional Archives Depository. one part, and the Rosehill Cemetery Company of the other part, in and by which agreement, the said Rosehill Cemetery Co., were to set apart an appropriate section of said Cemetery grounds, (to be increased from time to time as circumstances required), as a burial place for all such bodies, as said City of Chicago by its proper officers might direct to be therein interred, and the said City of Chicago agreed to pay for each and every of such interments the sum of One Dollar and fifty cents; and whereas it was also agreed by the said Cemetery Co, that they would make any interments in their grounds, which might be desired, other than such as were made at the expense of said city, for the sum of Two Dollars, for each and every, of such other interments, thus affording facilities for the interment of such bodies as has been for years before, made in the Public ground of the Chicago City Cemetery. 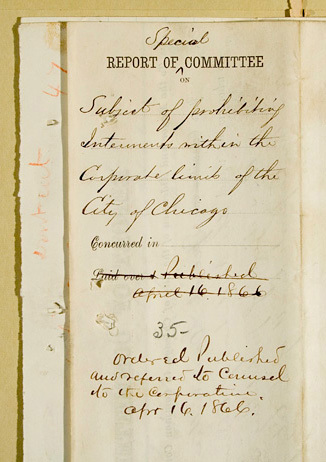 it is hereby resolved, that the Board of Public Works, or other proper officers of the said City of Chicago, are hereby directed to see that the provisions of said ordinances are immediately carried into effect, from this time and that no permission be granted for the burial of any bodies brought for interment, in the said Public ground of said Chicago City Cemetery. Presented to the Mayor for approval Sept. 7th 1865. Jno. S. Zimmerman City Clerk. The Common Council wrote several ordinances relative to prohibiting further burials in the City Cemetery. 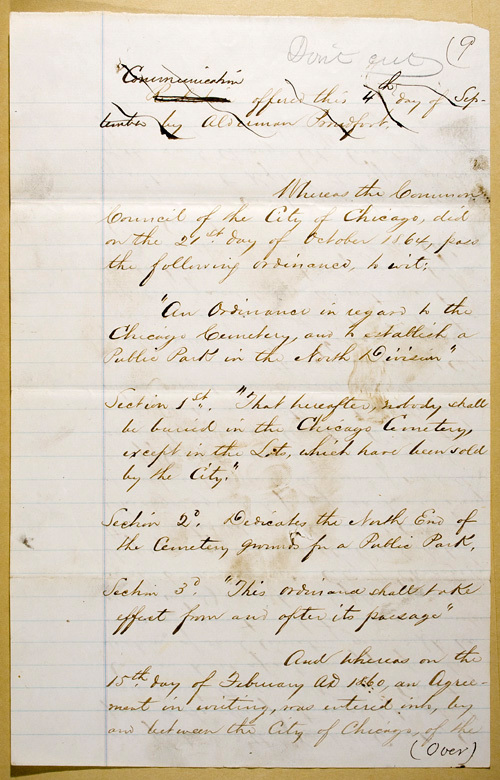 This ordinance, published in Chapter VI of the new City Charter, was written in 1865. Sec. 2. 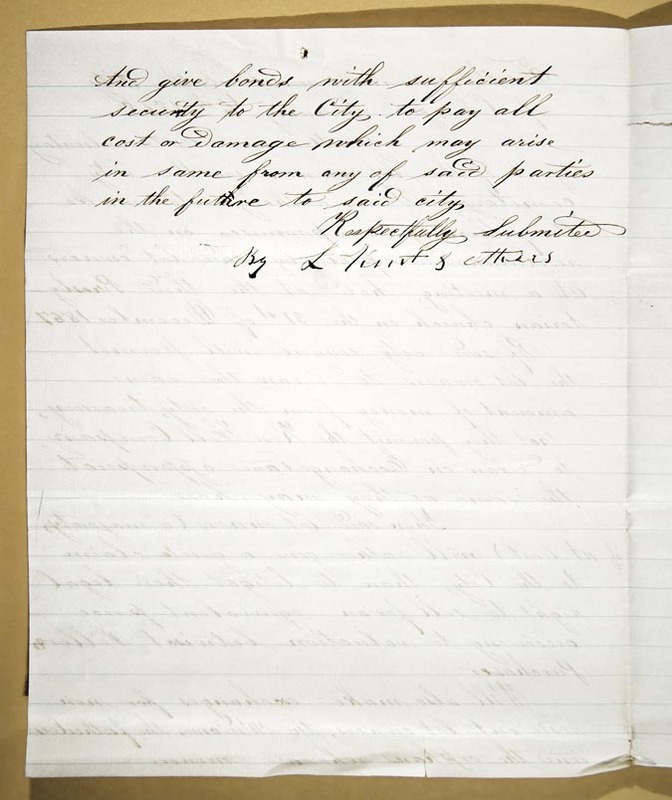 All moneys hitherto arising from the sale of lots therein, shall be kept a distinct fund, and be exclusively expended in adding to or ornamenting and improving the cemetery grounds not set apart above as a park, and the board of public works are hereby authorized and empowered to take such steps as they may deem proper for the improvement of the cemetery grounds, and to improve the walks and drains, or ditches, connected therewith, in such manner as they may deem most conducive to public convenience, and the proper preservation of the same; and for the payment of all such expenses, they shall certify their approval of the same to the comptroller, who shall pay the same by draft on the treasurer, payable out of the cemetery fund. Sec. 3. 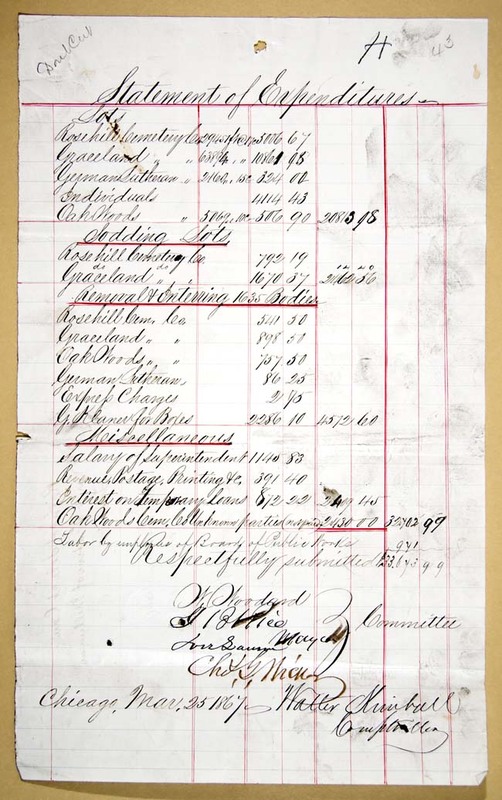 The Board of Public Works shall keep a record, in which shall be recorded the number of every lot heretofore sold in the cemetery, beginning with number one, with columns ruled therein for the name of the purchaser, the appraisal, price sold for, and date of sale; and the treasurer shall keep a cemetery account, in which all moneys received or paid on account of the cemetery, shall be entered. Sec. 4. If any person shall bury or attempt to bury any dead body in any unsold lot, or in any lot belonging to another, without permission in writing; or be found discharging firearms, hunting or trespassing in any other matter in the cemetery; or shall injure, deface or destroy any tree, shrub, stone, stake, post, fence, monument, vault or other fixture, building or thing of value or ornament in the cemetery, or trespass on any grave in the cemetery, he or they shall severally be subjected to a fine not less than ten dollars nor exceeding five hundred dollars; and the court or magistrate may, in any aggravated case, cause the offender to be imprisoned for a period not exceeding six months, in addition to the fine. In this document, the legal counsel to the city is giving his opinion on the city's authority to prohibit further burials in the City Cemetery. The words, "intramural interments" refer to burials within city limits, a practice that was challenged for its sanitary risks of having the dead in close proximity to the living population. During this time, as a result of litigation, the City was also dealing with the removal of the dead from the Milliman Tract. The Ordinance itself is in the Tab, above. I have examined the Ordinance, concerning Intramural Interments, referred to me at your last regular meeting. Whether you possess the power to pass it, is a question of fact, rather than of law. The charter authorizes you, “to regulate the burial of the dead, “to abate all nuisances which are or may be injurious to the public health,” and “to do all acts and make all regulations which may be necessary or expediant for the preservation of health and the suppression of disease.” Laws & Ordinances of the City, pages, 28 & 31. If it be true, that the prohibition of interments within the limits of the City, is necessary, as a sanitary measure, you have the power to pass the proposed ordinance. This is a question of fact which you must determine from the best light within your reach. To the Mayor and Aldermen of the City of Chicago in Common Council assembled. Your Committee report, that no liability whatever is incurred by the City, for the indemnification of lot owners in the Old City Cemetery for the reason that the ordinance does not provide for the taking possession of these lots by the City, or for the eviction of the present owners, but it merely provides that as a Sanitary measure, further interments therein be prohibited: Your Committee are of the opinion (taking into consideration the fact, that there is not a dissenting opinion among the medical men of this City, as well as of the whole world so far as your Committee are informed, as to the prejudicial influence, of Cemeteries in close proximity to crowded cities) that it is due to the Citizens of Chicago, that this ordinance should be passed. 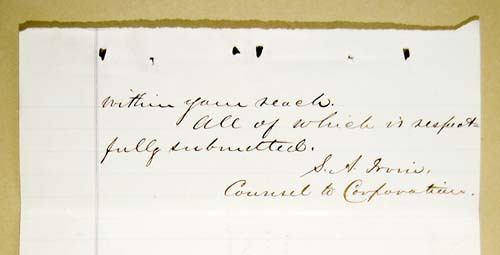 Your Committee would suggest that, if agreeable to all parties, some arrangement might be entered into, with the lot owners, whereby upon the future vacation of these lots by the owners, and a conveyance of the same in fee simple, to the City; the original price paid, (or such sum as the Council may decide upon) be refunded to such lot owners as may desire to make such arrangement. Section 1 Be it ordained by the Common Council of the City of Chicago: That hereafter no body shall be buried in either the City, or Catholic Cemeteries in the North Division, nor within the Corporate limits of the City of Chicago. Section 2 Any person who shall violate the provisions of this ordinance shall be liable to a fine of $250.00 for each and every such violation. Section 3 All ordinances or part of ordinances heretofore passed which may be in conflict with this ordinance, are hereby repealed. Section 4 This ordinance shall be in full force and effect from and after its passage, and due publication. 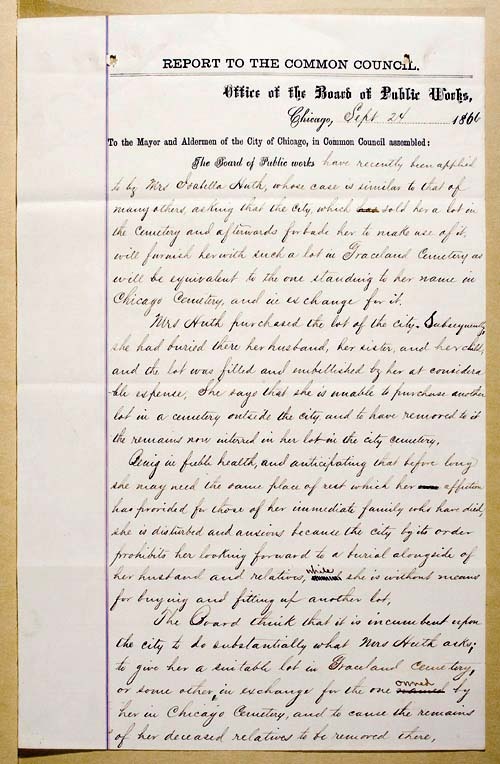 Both documents on this page, courtesy of the Illinois Regional Archives Depository. 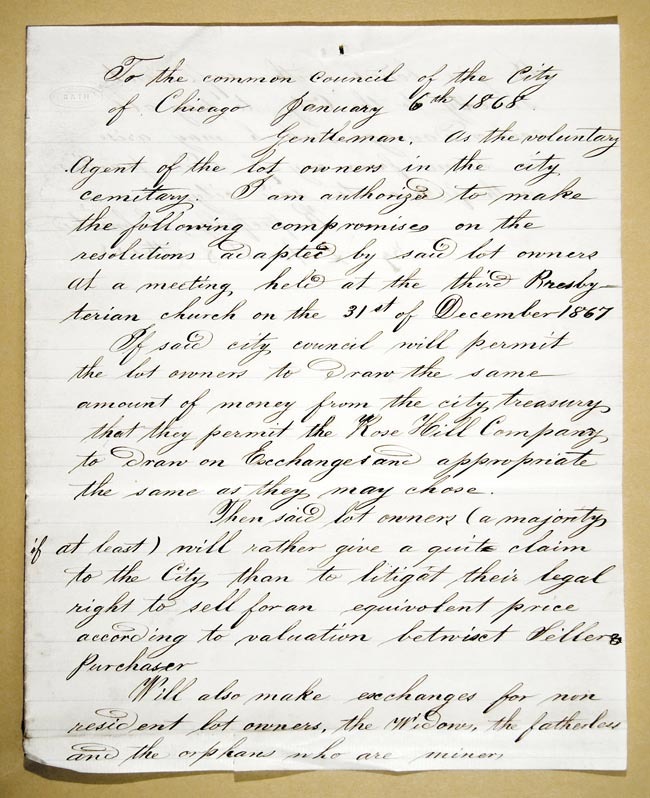 In 1866, Isabelle Huth, a widow whose deceased husband, sister, and child were buried in the City Cemetery's Milliman Tract, made an unsuccessful plea to the Board of Public Works for the city to pay for the disinterment of three family members and the cost of a similarly sized lot in Graceland Cemetery. The Commissioners of the Board of Public Works supported her plea and submitted it on her behalf to the Common Council. 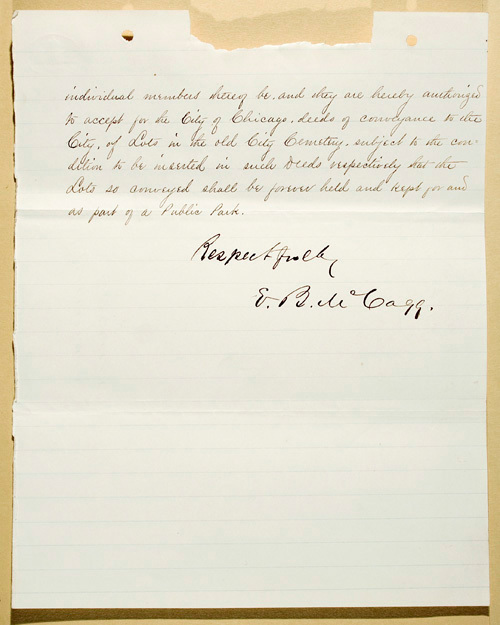 The Board of Public works have recently been applied to by Mrs. Isabella Huth, whose case is similar to that of many others, asking that the city, which sold her a lot in the Cemetery and afterwards forbade her to make use of it, will furnish her with such a lot in Graceland Cemetery as will be equivalent to the one standing to her name in Chicago Cemetery, and in exchange for it. Mrs. Huth purchased the lot of the city. Subsequently, she had buried there her husband, her sister, and her child, and the lot was filled and embellished by her at considerable expense. She says that she is unable to purchase another lot in a cemetery outside the city, and to have removed to it the remains now interred in her lot in the city cemetery. Being in feeble health, and anticipating that before long she may need the same place of rest which her affection has provided for those of her immediate family who have died, she is disturbed and anxious because the city by its order prohibits her looking forward to a burial alongside of her husband and relations, while she is without means for buying and fitting up another lot. 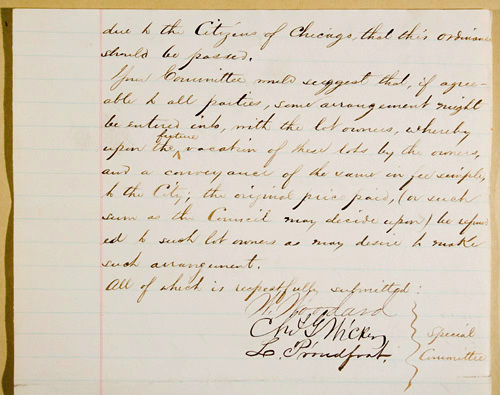 The Board think that it is incumbent upon the city to do substantially what Mrs. Huth asks; to give her a suitable lot in Graceland Cemetery, or some other, in exchange for the one owned by her in Chicago’s Cemetery, and to cause the remains of her deceased relations to be removed there. 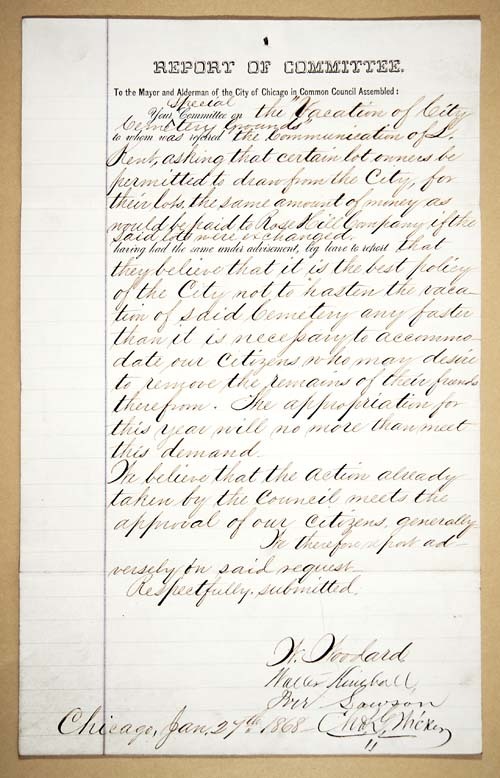 We respectfully ask that her application to the City as made to this Board, may receive all due consideration at your hands, and that you will adopt such measures as will relieve her and others similarly situated. Having had the same under advisement, be leave to report that there is not now any power in the Council to make the provision asked for and your Committee are therefore powerless toward making any recommendation. It is expected that the legislature of the coming winter will make some provision whereby the City can do justice to parties who have lots in the old cemetery and are situated similar to Mrs. Huth. During this complicated time of transition of the cemetery grounds, a central factor contributing to the ongoing disinterments was the need for the City to evacuate a 12-acre parcel of land called the Milliman Tract. See information about the Milliman Tract here. This statement of expenditures details the cost to the city for the removal of 1,635 bodies from the Milliman Tract to the new private cemeteries outside Chicago's then city limits. Courtesy of the Illinois Regional Archives Depository. 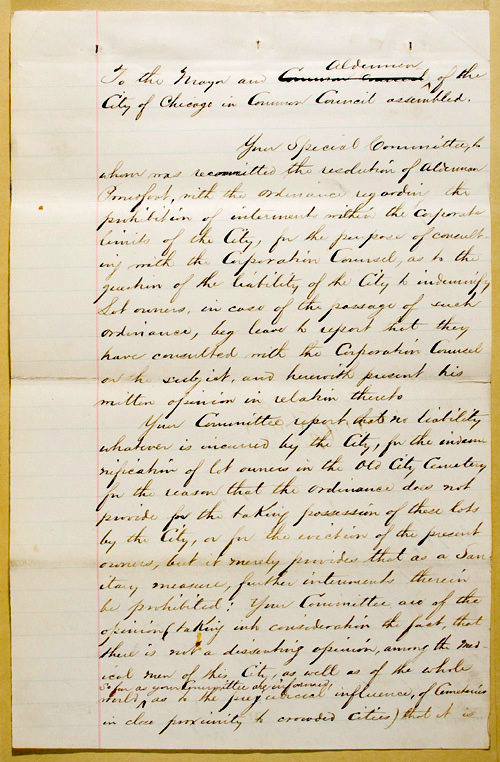 Gentleman, As the voluntary Agent of the lot owners in the city cemitary, I am authorized to make the following compromises on the resolutions adapted by the said lot owners at a meeting held at the third Presbyterian church on the 31st of December 1867. If said city council will permit the lot owners to draw the same amount of money from the city treasury that they permit the Rose Hill Company to draw on Exchanges and appropriate the same as they may choose. Then said lot owners (a majority if at least) will rather give a quit claim to the City than to litigate their legal right to sell for an equivalent price according to valuation betwixt Seller & Purchaser. Will also make exchanges for non resident lot owners, the Widows, the fatherless and the orphans who are miners. Your Special Committee on the “Vacation of City Cemetery Grounds” to whom was referred the Communication of L. Kent, asking that certain lot owners be permitted to draw from the City, for their lots, the same amount of money as would be paid to Rose Hill Company if the said lots were exchanged, having had the same under advisement, beg leave to report that they believe that it is the best policy of the City not to hasten the vacation of said Cemetery any faster than it is necessary to accommodate our Citizens who may desire to remove the remains of their friends therefrom. The appropriation for this year will no more than meet this demand. We believe that the action already taken by the Council meets the approval of our Citizens, generally. This is a communication from a Lincoln Park Commissioner. The commissioners were given jurisdiction over the park and cemetery grounds in February 1869. At this point, the Lincoln Park section begins to overlap with the City Cemetery section of this project. Several persons, owners of Lots in the old City Cemetery have expressed a willingness to convey such Lots to the City without cost, upon condition that they be forever held and kept for and as part of a Public Park. 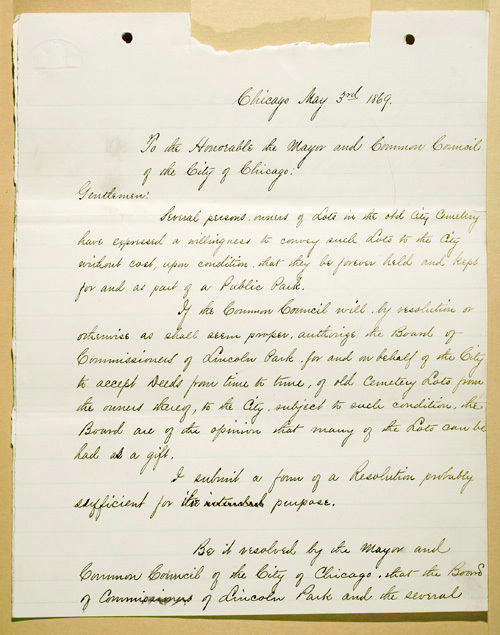 If the Common Council will by resolution or otherwise as shall seem proper, authorize the Board of Commissioners of Lincoln Park, for and on behalf of the City to accept Deeds from time to time, of old Cemetery Lots from the owners thereof, to the City, subject to such condition, the Board are of the opinion that many of the Lots can be had as a gift. I submit a form of a Resolution probably sufficient for its purpose. 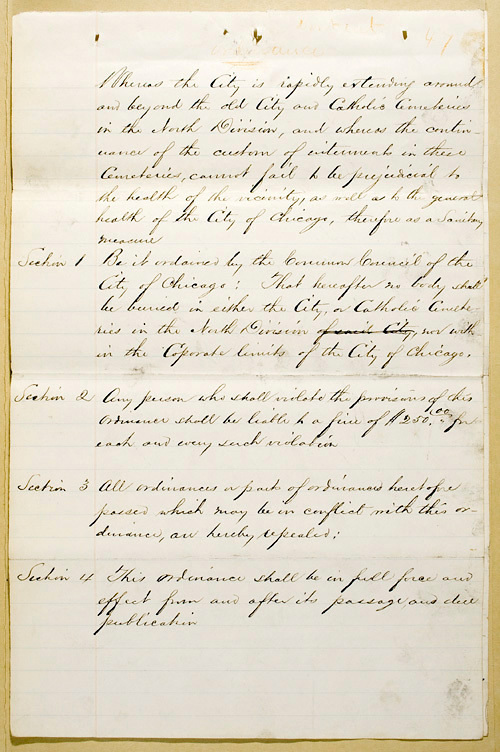 Be it resolved by the Mayor and Common Council of the City of Chicago, that the Board of Commissioners of Lincoln Park and the several individual members thereof be and they are hereby authorized to accept for the city of Chicago, deeds of conveyance to the City, of Lots in the old City Cemetery, subject to the condition to be inserted in such Deeds respectively that the Lots so conveyed shall be forever held and kept for as part of a Public Park.